We are proud to announce the addition of a revolutionary new test in the diagnosis of glaucoma. We are the first optometry office in Quebec to obtain this test. Glaucoma is a leading cause of blindness. Glaucoma can cause vision loss without any symptoms or pain and in fact half of those with the disease do not know they have it. Unlike the puff test which can miss 1/3 of glaucoma cases the GDX exam measures the thickness of the nerve fibers in the back of the eye. If this layer is thinner than normal, this could indicate glaucoma long before any vision has been lost. 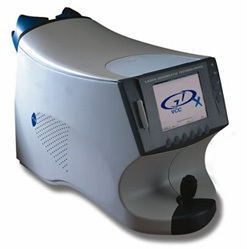 The GDX scans your eyes safely in about 1 minute and a report is created that we can quickly analyze.